Prime Minister Lee Nak-yon on Tuesday blamed high rents and royalty fees as the main causes of difficulties for small business owners as he called for measures to help such businesses tide over the rise in minimum wage. Next year's minimum wage has been set at 8,350 won ($ 7.37) per hour, up 10.9 percent from this year. That marked a double-digit rise for the second consecutive year following a 16.4 percent increase in this year's minimum wage. The raise sparked strong protests from businesses, especially those running convenience stores and other small shops that rely on part-time workers. Labor groups have also voiced complaints, saying the increase is not enough. "The labor circles protest that the raise is not enough. Self-employed people and other small business owners complain that management burden has increased ... 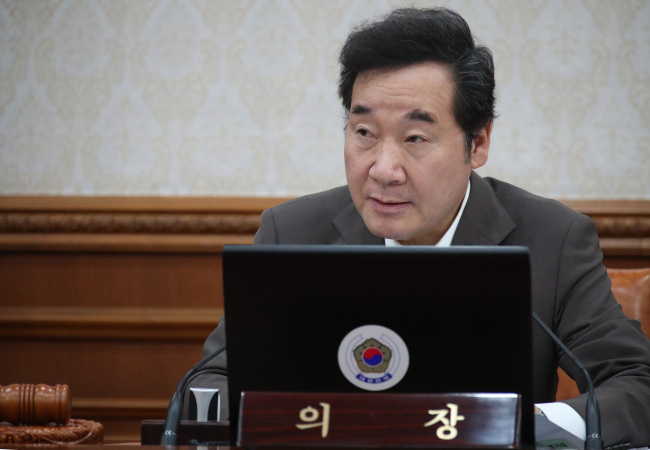 In a restricted situation like this, the government should look for the best or the second-best way" to deal with the issue, Lee said during a Cabinet meeting. All government ministries and agencies should pool their wisdom and help the minimum wage increase make a soft landing through measures to support small businesses, such as protection of tenants and franchisees from high rents and royalty fees. "It is true that a rise in minimum wage increases management burden for small business owners. That should be dealt with as it is," Lee said. "However, the management burdens of small business owners stem more from factors like rents and franchise (fees)."